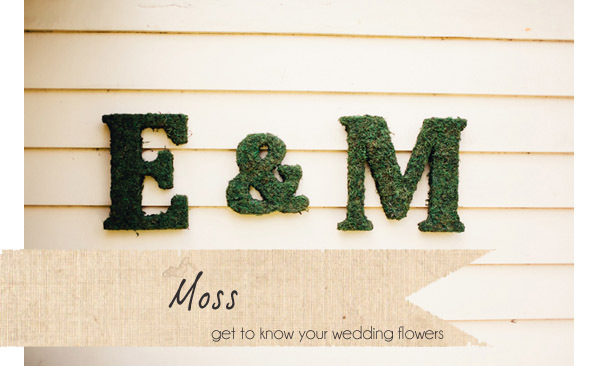 Rather than flowers this week we have chosen to talk about using moss at weddings. 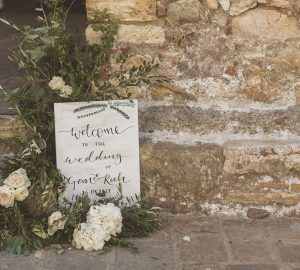 This is becoming increasingly popular with brides looking for a rustic wedding, woodland or outdoor wedding. Using moss within your wedding creates a natural look to your flowers and décor. Over to Karen Morgan, Passion for Flowers to answer all your moss related wedding questions. What season is moss available in? Moss can be bought all year round although it is most readily available at the market or garden centre in spring and summer when it is sold in bags ready for lining hanging baskets. It also comes in during the winter for covering wreaths. It keeps for ages in a bag. Here at Passion for Flowers we generally use sphagnum moss although you can buy sheet moss. What style of wedding would moss be most suitable for? 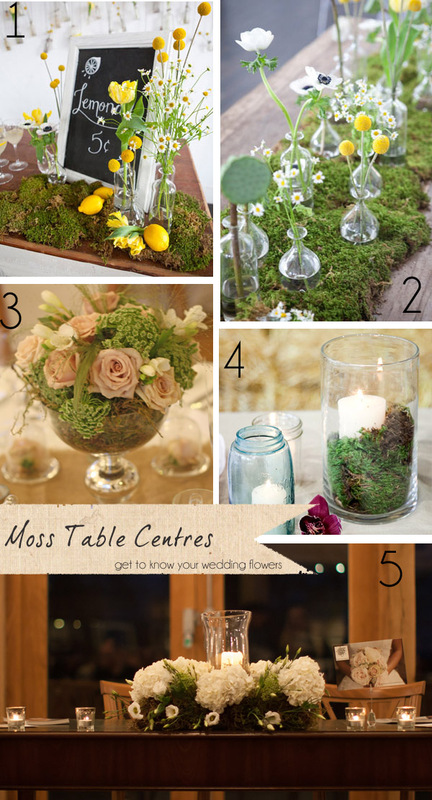 Moss is most suitable for a rustic or country wedding. It is a must for a spring or summer outdoor wedding or ceremony. What colours / style of flowers does moss work well with? We love moss with fresh spring flowers, it works beautifully with bright yellows and whites, lemons with craspedia, anemones and daisies. Moss is also perfect with a green and white colour scheme, hydrangeas, roses, lisianthus and dill. How can you create moss centrepieces? Create a runner along the length of the top table with moss and then set small glass bottles and jars into this with simple country flowers – bring the outside in. We love lining glass footed bowls with moss and adding a mix of amni, roses, freesias and grasses, set on a hessian square or runner for more of a rustic style. Moss is great to cover oasis and create a ceremony or top table decoration, white hydrangeas and lisianthus are a perfect match. Fill the hurricanes with a touch of moss before adding candles. 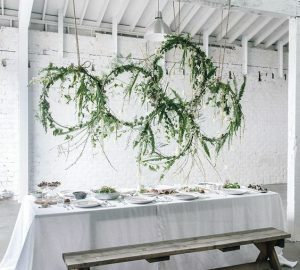 What other ideas do you have for using moss at weddings? Use moss to make a rustic ring cushion, add a couple of succulents for extra texture. 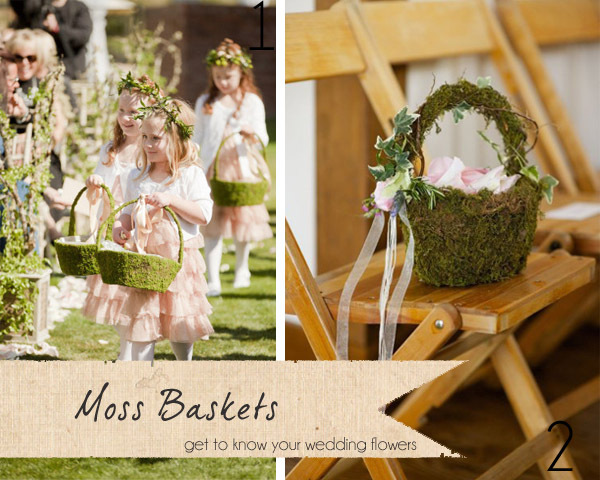 Moss can be used to cover rustic baskets for flower girls, simply add petals for them to scatter down the aisle and some ribbons and ivy. You can also buy pre-covered baskets with synthetic moss to make life easy. Moss can be used to fill teacups and then add a couple of spring blooms. 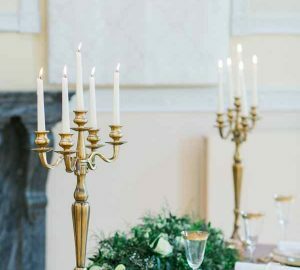 Line the aisle or steps at your venue with hurricane vases with moss at the base and candles to light your way. Make sure the moss is well away from the flame. 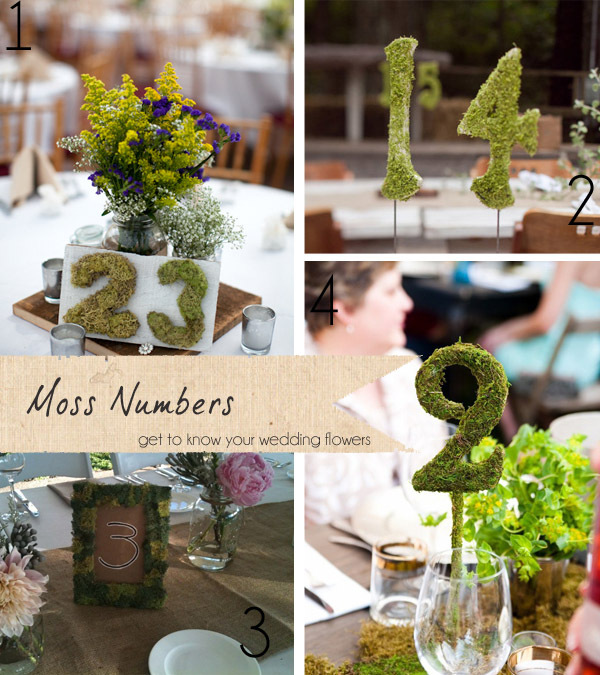 To keep to a rustic theme use moss covered letters as chairs backs for the bride and groom; or for table numbers edge a frame with moss or cover numbers with moss to create the table numbers. How long do moss arrangements last for? 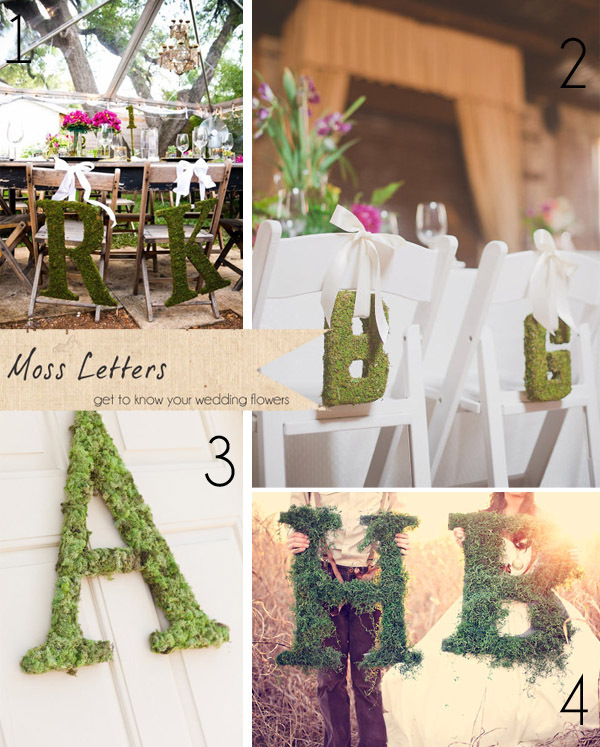 The moss covered letters last well as they dry out and can be kept as a great memento of your wedding day.